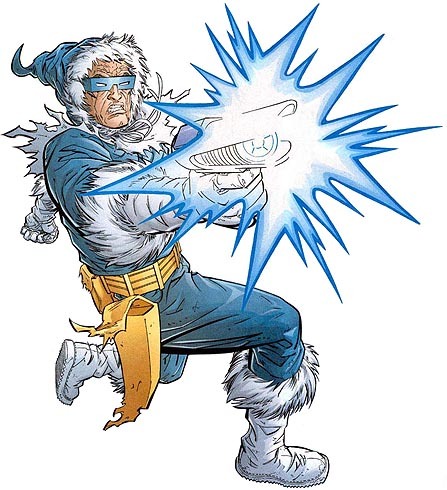 Cold Gun: Captain Cold has a gun that is powered by a cyclotron. The gun negates kinetic energy and produces a freezing effect. Leonard Snart grew up in a trailer park outside of central city with his sister. His father was an alcoholic and his mother frequently left after the beatings his father handed her. His father would also regularly beat Leonard and his Sister. Their only respite was their Grand Father who was an ice deliveryman, who would take them with him on his rounds. However Leonard’s Grandfather died and with it all the good things in his life. Years later he left his sister with his father and joined up with a gang of criminals. Their first robbery was foiled by the then Flash Barry Allen and Leonard was sent to prison. While incarcerated Leonard studied kinetic energy and thermal motion with a plan to face of against the Flash when he was released. On his release he stole some blue prints from a lab and created his cold gun. Adopting the identity Captain Cold he set out on his career of crime.